VERY QUICK TO KNIT and worked in one piece, from the hem, with shoulder seams. The top section of the front and back of this summer wardrobe basic are identical, and the body is worked in rounds, beginning at the hem. Fitted sleeves are worked with right and left slant increases and short rows are used for shoulders - instructions included. Hem and cuffs are in rib and the boat neck is finished in reverse Stocking stitch. 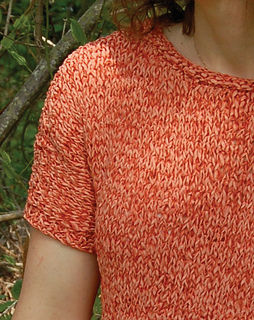 This pattern, also worked in tape, is very similar to my Capri Top to Knit, K2.21, but a quicker knit with a slightly larger gauge – pick colors to complete your wardrobe and make a few!